We appreciate your asking about near-death experiences and IANDS. This page includes the information most frequently requested by journalists and other media representatives. For general background, please first read this page and scan rest of the IANDS web site, which contains a great deal of information. If you need information you can't find here or on the many other sites on the web, you can contact our office. If you are with the print media, since we are probably not in your publishing area, we would appreciate receiving a copy of your finished article for our files. A near-death experience, or NDE, is a profound psychological event with transcendental and mystical elements, that may occur to a person close to death or in situations of physical or emotional crisis. By itself, an NDE is an unusual event but is not an indication of a mental health problem. Across thousands of years and in cultures around the world, NDEs follow a broad general pattern with common features. An NDE typically includes one or more of the following: a sense of leaving the body; movement, often through a tunnel; being engulfed in light or darkness; feelings of intense and indescribable love, peace and sometimes terror; perceived encounters with deceased loved ones, unfamiliar entities and/or spiritual presences; a life review; a landscape; an overpowering sense of knowledge and purpose. The effects of an NDE or related experience are often powerful, enduring, and may be life-altering. Coming close to death without any of these special features is not a "near-death experience." See Key NDE Facts for more background information about NDEs and IANDS. Click here for the archive of NDE accounts submitted to the IANDS website. Like IANDS itself, the Association's publications and programs are unique. The quarterly magazine, Vital Signs , and the scholarly, peer-reviewed Journal of Near-Death Studies provide information and intelligent discussion generally not available anywhere else. The mission of IANDS is to be the most reliable source of information in the field of near-death studies, encouraging scholarly study and the exchange of ideas about near-death, at-death and related experiences; disseminating educational information about them; serving as a common forum and community for experiencers and interested others; and facilitating the spread of knowledge to professional settings and people of all walks of life, religions, and cultures. Click here to contact the IANDS office to connect with board members, researchers and experiencers. Click here for the key people involved in the International Association for Near-Death Studies. IANDS is a nonprofit 501-c(3) organization which receives its funding through membership dues, programs and contributions. Near-death experiences have occurred for thousands of years. Today's major studies have indicated that of people who come close to death or experience extreme situations of physical or emotional crisis, 35-40% may later report an NDE; of those who have had a cardiac arrest, perhaps 10-18% may remember an NDE. No one knows whether the other people in similar circumstances do not have an NDE, have one but do not remember, or choose not to discuss it. According to a 1982 Gallup study and its subsequent update, in the USA alone between eight and thirteen million adults have had an NDE; no estimate exists of the number of experiences among children. What does IANDS do, anyway? 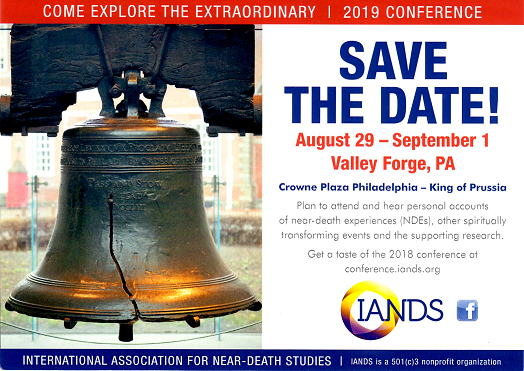 IANDS provides information services about near-death and similar experiences; encourages research; and serves as a networking organization for near-death experiencers and their families and caregivers. It publishes a quarterly magazine, scholarly journal, and a variety of informational materials; sponsors an annual North American conference; and coordinates a loose consortium of support groups in the US and Canada. Can IANDS get me experiencers to interview? IANDS can help, but locally-developed sources may be better. We are finding many of our usual media-competent referrals resistant to more exposure, or their accounts have lost their emotional edge through over-telling. Contact the IANDS office and ask to be put in touch with the Media Coordinator. This is your very best bet. Advertise. A notice on a bulletin board, in a publication, or on-air usually produces good response; however, keep in mind that you will be getting unknown and unscreened individuals who may or may not be appropriate (or honest). Nurses (less often physicians) may be able to suggest experiencers. Tell everyone you know that you want to talk to near-death experiencers. You're likely to find people closer than you expect. How can I find an expert? Talk to a member of IANDS Board of Directors or the Journal's Editorial Board. Most are professionals, knowledgeable in the field, and likely to be more readily available for interviews. Some leaders of IANDS support groups are both experiencers and professionals who know the research and may be able to refer you to people to interview. Again, ask the IANDS Media Coordinator for help. And keep in mind—not every MD is an expert, and not every expert is an MD.